Scary-Crayon: Forkless Gourmet Bun Meals -- Margarita Chicken (Chicken) with Tomato Lime Salsa! Ah, Forkless Gourmet Bun Meals. I think we've pretty much said all there is to say about them in an introductory capacity in the previous bun meal reviews (Kung Pao Shrimp and Chicken with Thai Style Peanut Sauce). All of my jokes about the paradoxical concept of "authentic" ethnic meals in a bun and the alien bread recipe have been made twice over. Hell, since this bun meal is made with chicken, I can't even make fun of the fact that those poor chickens were RAISED WITHOUT ANTIBIOTICS -- 'cause we did that last time, too. I'm tapped out when it comes to bun meal commentary, folks, and rather than bore you with the same corny jokes, I'm going let a fresh voice do the honors. That's right -- I'm not roasting the Margarita Chicken Chicken with Tomato Lime Salsa Bun Meal. 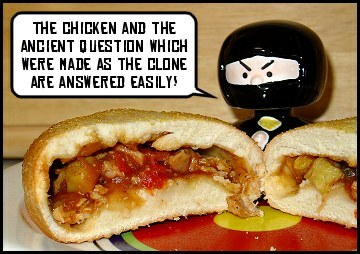 Meet your special guest commentator for today: the Ninja Bobblehead. Okay, maybe that was a bad idea. Not only does the Ninja Bobblehead not speak English -- that translation of his speech was supplied by Babel Fish -- but he's a little loopy due to a violent fall that cracked his skull. Please to forgive him! I think he was saying something about the redundancy of the box's "Margarita Chicken / chicken with tomato lime salsa" text. Last time, the text read, "Chicken / with thai style peanut sauce," which made sense. We already knew it was chicken. It's kinda implied! 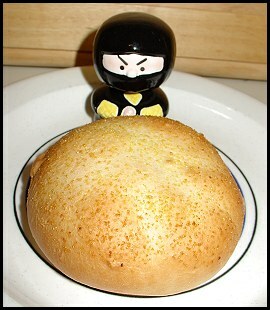 We didn't need it repeated, and the Ninja Bobblehead picked up on that. See, he's not retarded... just a little off. Don't ask me what the hell he said about Ohio, though -- you can't expect me to comprehend the badly translated ramblings of a brain-damaged ninja with 100% accuracy. So, on to the review. This one was kinda interesting as far as taste goes -- and nowhere near bad, mind you -- but I'd have to rank it at the bottom of the bun meal outings. According to the box, the Margarita Chicken Chicken with Tomato Lime Salsa Bun Meal sports "tangy flavors" comprised of "all natural chicken with vine ripened tomatoes and fire roasted yellow zucchini, red onions and poblano chiles in [their] authentic signature Margarita Salsa." Some of their other claims may or may not be true -- I can't vouche for the vine ripened tomatoes or the fire roasted zucchini, and seeing as how the process of cloning artificial chicken meat is in its infancy I'd have to grant that the chicken is probably all natural -- but I'd have to agree about the tangy part. That's not necessarily a good thing, though. I don't know about you, but while I may be a fan of lime in certain alcoholic drinks, I'm not a fan of it on my chicken -- and of all of the flavors in this bun meal, the limey tang probably comes through the strongest. It's not just like eating a lime, mind you, and you can taste the vegetables in there, but you still might as well be eating chicken dipped in lime juice. If that thought makes you salivate, well, bon appetit! Personally, I'd prefer some Kung Pao Shrimp. But I suppose it tastes like it's supposed to, and it's hard to beat for the price. There are certainly worse ways to spend a buck!